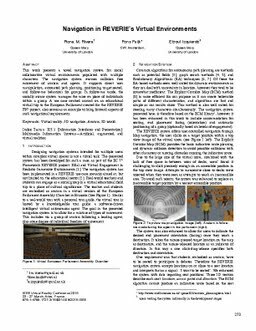 This work presents a novel navigation system for social collaborative virtual environments populated with multiple characters. The navigation system ensures collision free movement of avatars and agents. It supports direct user manipulation, automated path planning, positioning to get seated, and follow-me behaviour for groups. In follow-me mode, the socially aware system manages the mise en place of individuals within a group. A use case centred around on an educational virtual trip to the European Parliament created for the REVERIE FP7 project, also serves as an example to bring forward aspects of such navigational requirements.